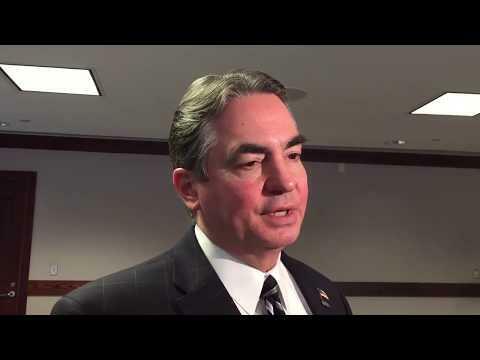 Springfield Mayor Domenic Sarno, a Democrat, endorsed Republican Gov. Charlie Baker for reelection in 2018. He also has been an outlier among Democratic mayors in Massachusetts because of his opposition to affording protections for undocumented immigrants. The Massachusetts Democratic Party will hold its next convention in Springfield this fall, but the city’s mayor, who is a Democrat, will not be invited to speak. As first reported by Politico, Democratic state committee members voted to hold the convention in Springfield on Sept 14 and voted not to invite Mayor Domenic Sarno to attend.
" You know, maybe they don't want to hear what I have to say," Sarno told WAMC News Tuesday. " I am a Democrat, but a moderate Democrat." Cited by some Democratic committee members was Sarno’s endorsement of Republican Gov. Charlie Baker in last year’s election and his opposition to an immigrant welcoming ordinance passed by the City Council. After learning of the snub, Sarno said he sent a handwritten note to Democratic State Party Chairman Gus Bickford offering his administration’s assistance to stage a successful event.